Neon Genesis Evangelion is a rather complex series, and to say too much would spoil the series, so I’ll keep it as general as possible. The show takes place in a post-apocalyptic world in the year 2015. Creatures called Angels are attacking the earth, and they can only be stopped with mecha called Evangelions. The pilots of these Evas are middle school children: Shinji Ikari, Rei Ayanami, and Asuka Langley Soryu. The characters all have their own issues to deal with, and these are expanded upon as the series goes on. While your mileage may vary on how much you like/dislike them, it goes without saying that they are definitely an interesting bunch. (Even Rei.) 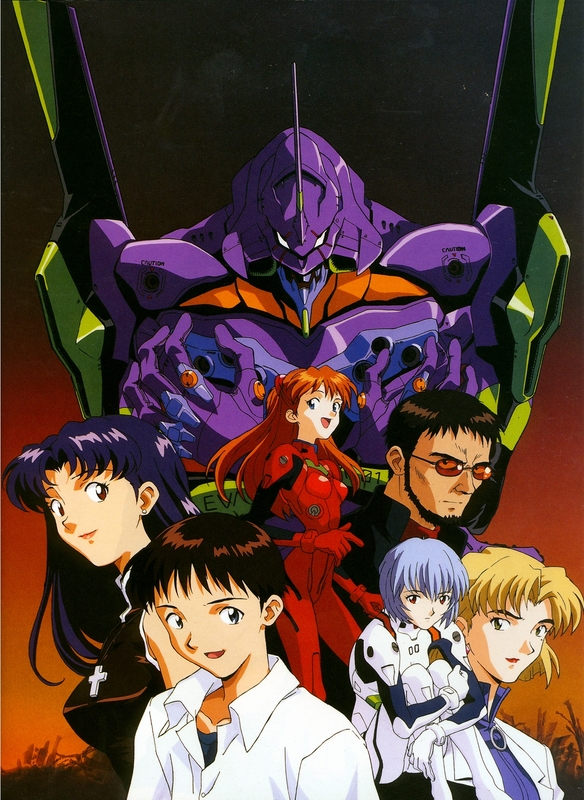 Oddly enough, Toonami did show two episodes of Evangelion back in 2003 for Giant Robots week. There are also several movies as well that are just as controversial, if not more so, than the TV series. N.B. This show is full of symbolism of all kinds. What it all means, I couldn’t tell you. Suffice to say that if you do a Google search for “meaning of Neon Genesis Evangelion” you’ll get quite a few results. 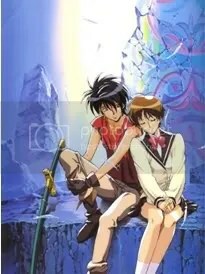 The Vision of Escaflowne is a fantasy story centering around Hitomi Kanzaki, a normal high school student who’s a member of the track team with a penchant for fortune telling. One evening while she is running, a boy fighting a dragon appears before her. It turns out they are from the planet Gaea. After fighting the dragon, she and Van are transported back to Gaea, and she finds out that Van is actually going to become the king of Fanelia. The Zaibach Empire attacks Fanelia while Van is being crowned, and it is then we find out exactly what Escaflowne is. The show offers a lot to everyone with plenty of action and romance, wonderful animation, creative mecha and music by Yoko Kanno. FOX showed some Escaflowne in 2000, I believe, but they cut the first episode, which we will, of course, be watching. There’s also a movie, but it’s extremely different from the television series and pretty much stands on its own. N.B. again-I cannot vouch for the likability of a certain cat girl. So there you have it, two awesome shows which I hope that you will enjoy. This entry was posted on December 2, 2010 at 7:29 pm and is filed under Weekly Updates. You can follow any responses to this entry through the RSS 2.0 feed. You can leave a response, or trackback from your own site. And looking forward to Eva. Lol…you do know that the creators themselves said that all the religious symbolism was put in there just to make the show look cool right?